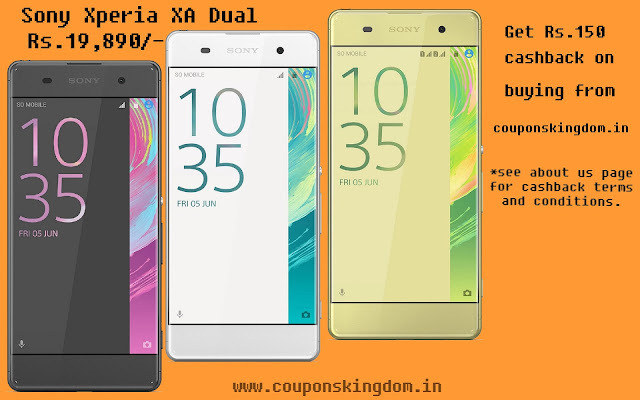 Cash on Delivery eligible on Sony Xperia XA Dual (Graphite Black). EMI starts at Rs.1,776.97 per month. 1) Sony Xperia XA Dual has 13MP primary camera with hybrid auto focus and 8MP front facing camera for low light selfies. 2) 12.7 centimeters (5-inch) HD capacitive touchscreen with 1280 x 720 pixels resolution, edge to edge design and mobile BRAVIA engine 2. 3) Android v6.0.1 Marshmallow operating system with 2GHz MediaTek Helio octa core processor, 2GB RAM, 16GB internal memory expandable up to 200GB and dual SIM (nano+nano) dual-standby (4G+2G). 4) 2300mAH lithium-ion battery upto 2 days life with stamina mode. 5) 1 year manufacturer warranty for device and 6 months manufacturer warranty for in-box accessories including batteries from the date of purchase.